Hi there!I saw your ad on craig's list for the cordless pottery fountain flowing candle and I am interested. 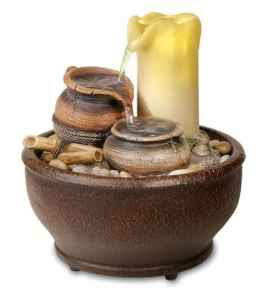 There is no doubt in my mind that this item would "add peaceful ambiance to any room" but as I am sure you are aware, it is never a great idea just to take a vendor's word that a cordless pottery fountain flowing candle is fully operational. Since I am not really in the Broadview and Danforth area much would it be possible for you to send a video (with audio!) of the cordless pottery fountain flowing candle in operation? Please do not take this request as a judgment of your character, I am just being careful as I have been burned (no pun intended LOL!) in the past in the same situation.